As an educator, you know that having access to on-level learning is essential to student success. But finding appropriate resources that differentiate and scaffold instruction effectively can be difficult. The Arrive Math™ Booster can provide you with resources to meet all of your students at their level and provide the appropriate amount of intervention they need to be successful, confident mathematicians. Discover how the Arrive Math Booster can make a difference in your school or classroom with flexible, universal intervention that supports the development of every student. Each content standard, across all grade levels from kindergarten through eighth grade, is broken into single skill sets to make up a module of instructional resources to help target misconceptions, building to full standard understanding. Module assessments are available to help indicate where students might need additional support to master a particular skill. Using real-time, actionable data from these module assessments, teachers can choose which Take Another Look and Guided Supports lessons would be the most beneficial in remediating knowledge gaps, providing meaningful practice, and targeting misconceptions. 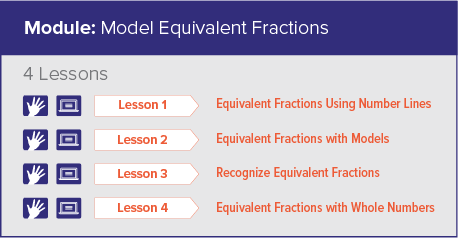 Explicit Modeling — A two- to three-minute video or animation introduces and models the skill or concept using essential math vocabulary. Interactive Practice — A series of engaging activities provide immediate feedback and encourage confidence through scaffolded repetition. Informative Assessment — A quick three to five question assessment checks their understanding and provides real-time, actionable data to inform instruction. Each skill standard has a 15-minute Guided Support lesson. These hands-on lessons accommodate additional learning styles by using physical manipulatives or classroom objects to accommodate additional learning styles to connect abstract concepts to real life. Teacher-led, guided discussion questions within the activity foster small group discussion, reinforce mathematical vocabulary, and uncover misconceptions while providing students a safe environment to verbally express understanding and expand their reasoning and problem-solving skills. Preview a sampler of Guided Support Lessons. Board games create memorable learning experiences where students have fun and practice math with their peers. The Games Kit offers 54 unique, out-of-the-box games that align with kindergarten through eighth-grade content standards. Each engaging game features variations that allow a range of accommodations to meet the needs of every student while they practice foundational skills and improve conceptual understanding. See the complete list of games in the Arrive Math Games Kit, including how the each game aligns to a specific level, strand, and math focus.